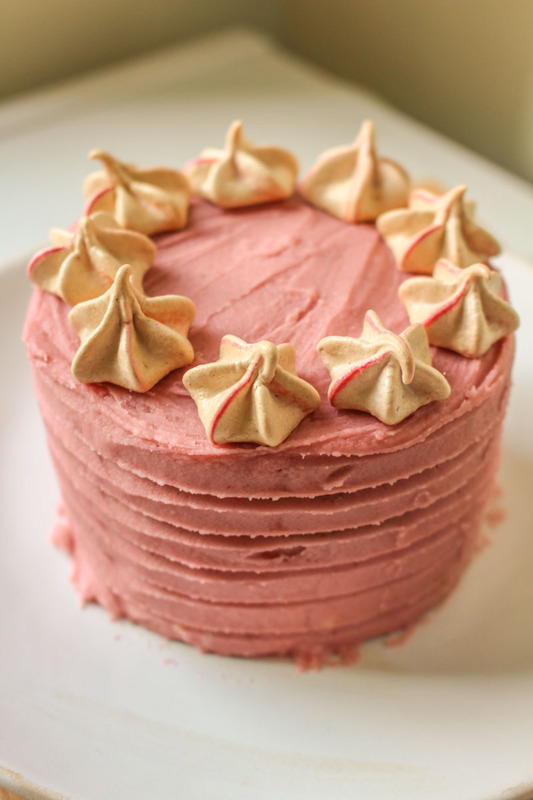 A light and fluffy white sponge cake, subtly flavoured with champagne, and smothered in creamy raspberry buttercream. 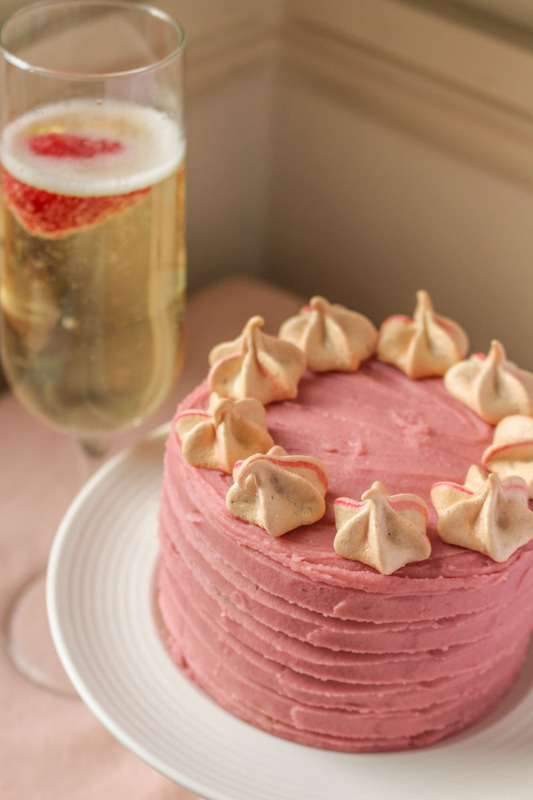 This champagne layer cake is recipe #2 in my hunt for delicious cake flavour combinations for our wedding cake. Remember how badly the peach layer cake went? Thankfully, this time things were a lot more successful. This cake uses only egg whites, which help keep the cake light and fluffy, as well as making it much paler in colour than a normal sponge. I find it really important to make sure the butter has been beaten extra well, to ensure there is not a single lump in the bowl before you go on to the next step. This will make it a lot easier when you come to incorporate the egg whites, which won’t be as forgiving as whole eggs when it comes to lumpy butter. Trust me. 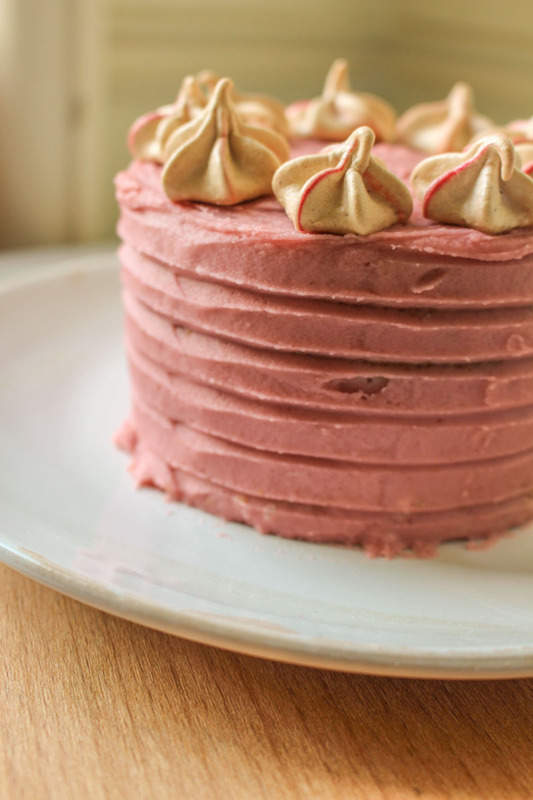 The buttercream recipe is a less-stiff version of this recipe from Sally’s Baking Addiction. I substituted whole milk for the butter Sally used, to make the frosting a lot more spreadable on a layer cake. I also decreased the amount of icing sugar in the recipe, as the raspberry jam already has a whole lot of sugar in it already. I think this frosting had just the right level of tartness to balance out the sweetness of the champagne sponge. 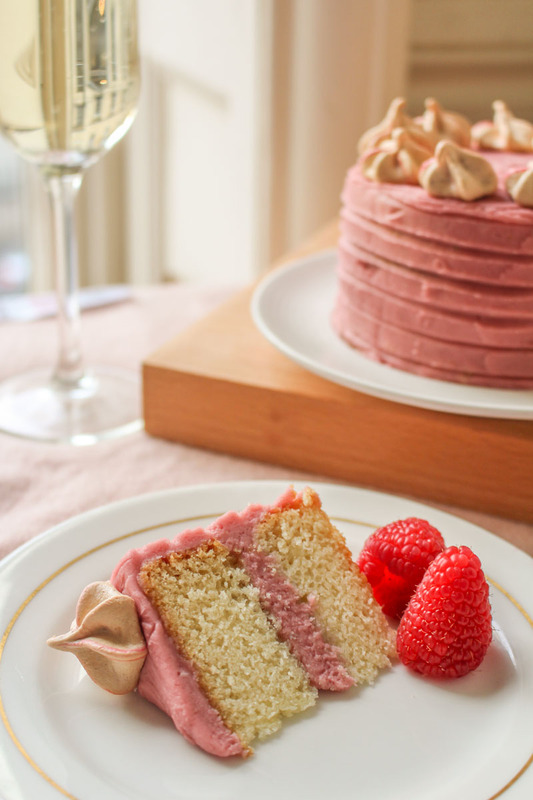 I would definitely recommend using raspberry buttercream with this cake, as vanilla frosting would be just too sweet. Of course, if super-sweet is your thing, then be my guest! I topped the cake with some little meringue kisses. If you know anything at all about meringues (and by that I mean if you’ve ever even seen a meringue) then you will notice that mine are over-baked. Learn from my mistakes – don’t try and cook meringues in the same oven in which you have just finished baking a cake. Let the oven cool right the way down first. I’m sure I will give meringues another go at some point soon. If you are thinking that the cake in the picture looks small, that’s because I’ve been making 4 inch miniature versions of all the cakes I’m testing for the wedding. We are only two people, and there’s only so much cake even we can eat. I’ve found that scaling down recipes for 8 inch cakes to 20% gives a good amount for two 4 inch layers. This may seem extreme (meaning I only used 1½ egg whites, for example) but it works. The 4 inch cakes will take a few minutes less to bake than their 8 inch counterparts, but if you keep an eye out then you won’t go too wrong. So yeah, at the moment it is looking like this cake has secured itself a spot in the final wedding cake line-up. Of course, there are still many more cakes left to try before June rolls around, so this beautiful cake may still get pipped at the post yet. 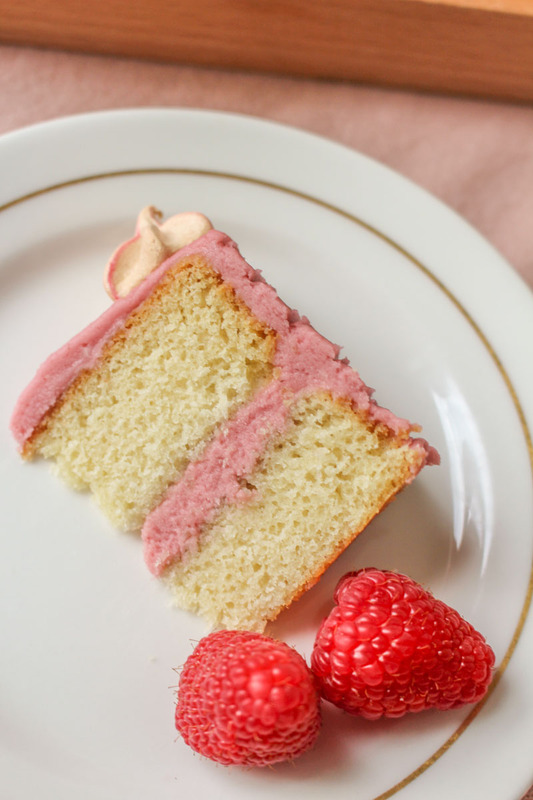 Please let me know if you have any ideas for great wedding cake flavour combinations – I am willing to give almost anything a go at this stage! Preheat the oven to 180°C / 350°F / 160°C fan. Grease and line three 8inch round cake tins. Using a stand or hand mixer, beat the butter until smooth and creamy. It is very important that the butter is as smooth as possible with this recipe, so make sure to spend the extra time beating all the lumps out of it. Add the sugar to the butter, and beat well. Add the egg whites to the butter and sugar mixture one at a time, beating well between each addition. Once fully incorporated, add the champagne, vanilla, and oil and mix well. Add the flour, baking powder, bicarbonate of soda, and salt to the batter, and mix well using a low setting. Pour one third of the batter into each of the three pre-prepared tins. Bake for 25 minutes, or until a toothpick or skewer inserted into the middle of the cake comes out clean. Leave in the tins to cool for 10 minutes, and then remove from the tins and place on a wire rack to cool completely. Once cool, cut the tops off of each of the cakes if necessary, to achieve three level cakes ready for icing. Using a stand or hand mixer, beat the butter until smooth and creamy. Add the icing sugar and mix well until fully combined. Add the milk, vanilla extract, and raspberry jam to the icing, and mix well. Sandwich the three cakes together using the buttercream, and then coat the outside of the cake with a thin 'crumb coat' of buttercream to prevent any crumbs getting onto the outside of the final icing layer. Put the cake into the fridge for an hour or so to harden. Store the remaining buttercream in the fridge, covered with cling-film. Once the crumb coat has hardened, cover the cake with the remaining buttercream. 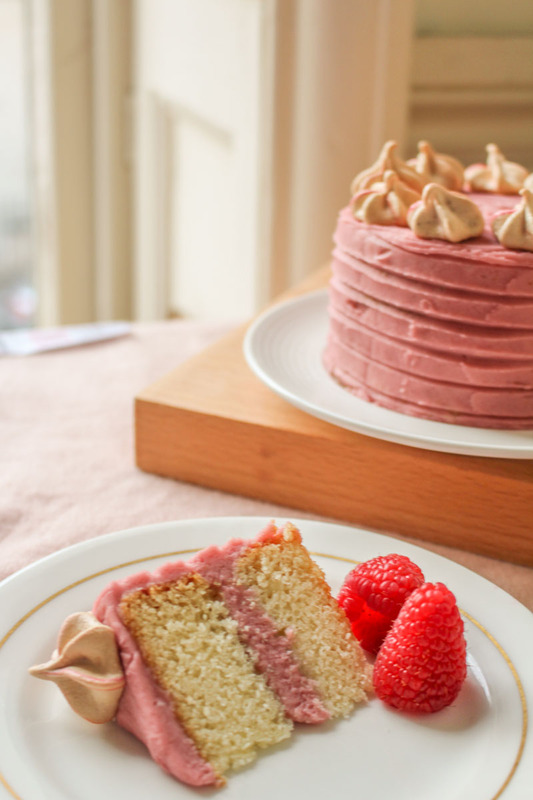 Decorate with meringues, fresh raspberries, or sprinkles. This cake will keep for a week if stored at room temperature in an airtight container. There is no need to store in the fridge. 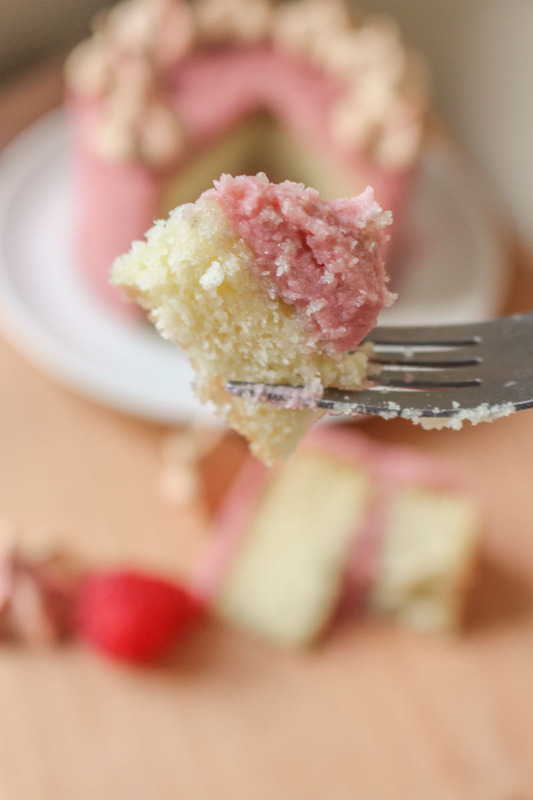 The cake can be frozen before being frosted for up to 3 months. This cake looks so nice! I couldn’t even tell that it was a miniature cake before you pointed it out! I was trying to find a champagne cake recipe and this is exactly what I was looking for, thanks! Good luck with your wedding cake testing, I’m looking forward to reading what other cake recipes you try! Thanks 🙂 Glad I could help! This. Is. Gorgeous! Totally my dream cake! Pinning this for the next time I have an occasion special enough for a champagne cake… or just a free Saturday and a bottle of bubbly to spare! Just wondering why only the egg whites are used and not whole eggs?